A developer now can view SEB APIs and test them, using either the portal or by writing an application accessing the APIs. The portal consists from the start of two API products – account information and payment information, with “sandbox data”. In autumn, external developers will also be able to apply for access to APIs with production data. 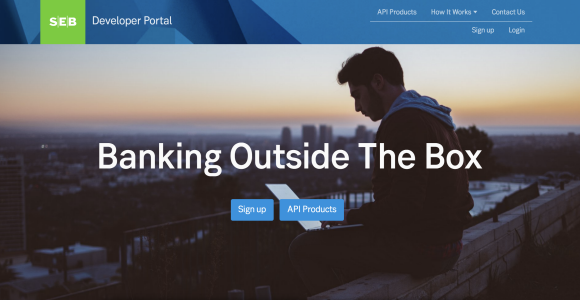 The portal is a step in a development that is expected to have a major impact on the banking world called Open Banking. Banks’ services and functions will be accessible and can be integrated into others’ systems and channels – regardless of whether they are banks or entirely other types of companies. And in the same way, banks can integrate services from other types of companies within their channels. Open Banking uses APIs (application programming interface) technology to promote simple and seamless integration with the financial and nonfinancial ecosystem. APIs are a standardised interface that makes it easy to develop new services and functions without having to integrate with the underlying system. APIs can be used to increase speed and flexibility in both internal and external development. – It requires that we have engaging content, with interesting, well-documented and easy-to-use APIs. But it is also a matter of having a well-managed portal that reflects SEB’s dedication to and investments in APIs and Open Banking, says Martina Wallenberg, responsible together with Daniel Franzén for the developer portal. The first version of SEB’s developer portal was released in March. At the time it was a closed portal and only open to pre-authorised developers. Now, it’s open to all.